As NASA prepares to launch a new Martian probe, a Florida State University scientist has uncovered what may be the first recognized example of ancient Martian crust. The work of Munir Humayun—a professor in FSU's Department of Earth, Ocean and Atmospheric Science and a researcher at the National High Magnetic Field Laboratory (MagLab)—is based on an analysis of a 4.4 billion-year-old Martian meteorite that was unearthed by Bedouin tribesmen in the Sahara desert. The rock (NWA 7533) may be the first recognized sample of ancient Martian crust and holds a wealth of information about the origin and age of the Red Planet's crust. Humayun's groundbreaking discoveries about the crust and what it reveals about the Red Planet's origins will be published in the journal Nature. In order to detect minute amounts of chemicals in this meteorite, Humayun and his collaborators performed complex analysis on the meteorite using an array of highly sophisticated mass spectrometers in the MagLab's geochemistry department. 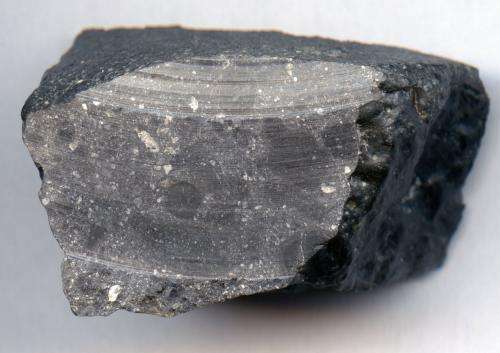 High concentrations of trace metals such as iridium, an element that indicates meteoritic bombardment, showed that this meteorite came from the elusive cratered area of Mars' southern highlands. "This cratered terrain has been long thought to hold the keys to Mars' birth and early childhood," Humayun said. While craters cover more than half of Mars, this is the first meteoric sample to come from this area and the first time researchers are able to understand Mars' early crustal growth. Using the chemical information found in pieces of soil contained in the meteorite, the researchers were able to calculate the thickness of Mars' crust. Their calculation aligned with estimates from independent spacecraft measurements and confirms that Mars did not experience a giant impact that melted the entire planet in its early history. Using a powerful microprobe at Curtin University in Perth, Australia, the team dated special crystals within the meteorite—called zircons—at an astounding 4.4 billion years old. Humayun's international team of collaborators include curator of meteorites Brigitte Zanda with the National Museum of Natural History (the Muséum National d'Histoire Naturelle) in Paris; A. Nemchin, M. Grange and A. Kennedy with Curtin University's Department of Applied Geology in Perth, Australia; and scientists R.H. Hewins, J.P. Lorand, C. Göpel, C. Fieni, S. Pont and D. Deldicque.